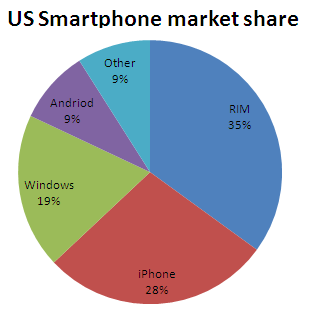 #1: RIM smartphones: 35% market share. – Apple predicted that in the second half of 2010, iAds will generate “48% of the entire US mobile display ad market,” approximately $60 million ad dollars. – According to the Nielson ranking data of US mobile phone browser usage, the iPhone is in first place with 58.2%; Android devices are 2nd, with 22.7%; RIM is 3rd, with 12.7%; other devices 6.4%. Jobs said 5 million ebooks downloaded in the first 65 days, or around 2 1/2 books per iPad, counting for a little over 20% of the eBook market, ruffling up Amazon with their Kindle device.